How cool is cooler corn? Wash the cooler inside and out. Depending on how it has been treated, you might want to sterilize it with boiling water! Directions: 1. Shuck the corn, removing the husks and silks. 2. Rinse the ears under running water. 3. If you like snap the ears of corn in half and drop into the cooler. 4. 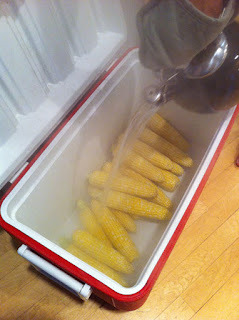 Pour boiling water over the corn, enough to cover and then some. Close the cooler and let it be for 30 minutes 5. After 30 minutes, check the corn and ENJOY! *If you don't want to eat it right away just leave the corn in the cooler with the hot water until you are ready to eat. 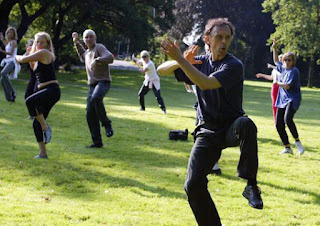 Sign up now for a 6-week Tai Chi course for beginners at Mt. Philo State Park on Wednesdays from 9:00 AM - 10:00 AM beginning September 12th! Course fee is $75 for six weeks and every single penny will be donated to the Vermont Food Bank! Each dollar donated to the food bank results in six meals, so if ten people sign up, we can contribute 4,500 meals to hungry Vermonters! Classes will be held at the Summit Lodge at Mount Philo. The folks at White Cloud Living Arts Foundation are generously donating their time and talent to teach the classes. Pre-registration is required and class is limited to 15 participants. No charge for park entry. To register call the park at 802-425-2390. Please make your check payable to "Vermont Food Bank". So why not do something good for yourself, and great for your neighbors and sign up today! 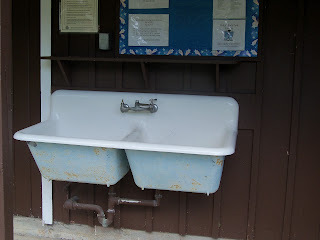 Camping at a Vermont State Park is a great way to enjoy the peace and quiet of nature away from the constant distraction of electronics but as you will find out, there are certain things that just don’t come as easily as they do at home, dishwashing is one of those things. Here are a few tips to make sure your dishes are clean and the environment is safe. It may seem so much easier to buy paper products and not worry about washing all those dishes but even 100% compostable products aren’t as environmentally friendly as they seem. Unless the state park you are visiting has a composting pile, all your trash is going to be mixed in with regular trash and thrown into landfills. When thrown into landfills, biodegradable and compostable products aren’t exposed to the necessary air, moisture and sunlight to break them down. With the conclusion of the season quickly approaching, parks may be noticing that their flowers aren’t as green and vibrantly colored as they once were. It is coming to that time of the year when the nights are getting colder and the spring and summer’s flora and fauna are beginning to brown, indicating autumn’s ultimate arrival. Those flowers that once speckled the entrance to your park, conveying that warm and inviting feeling, will now need to be pulled, and that feeling will now be gone. Or will it? Starting your week right with Breakfast! Breakfast is one of the most important meals of the day and that doesn’t change when you are camping. No matter how awesome bacon is, it’s good to have variety in our diet and what a great time camping can be to try out all those recipes you’ve been saving up. Planning is an important first step to a successful meal around the campfire. Here are some tips to make your meals as simple and easy as possible. · - Keep preparation to the minimum by chopping, shredding, or slicing ingredients at home. Measure the necessary amounts and pack them in disposable or reusable containers or zip-close bags. · -Pack perishable items in a cooler loaded with ice-packs or ice blocks, and keep cold until ready to cook. · · - Explore the area surrounding the campground. Look out for great local farmers markets where you can get some fresh vegetables and fruit. Nearly 80 years after young men from the CivilianConservation Corps (CCC) constructed what is now Coolidge State Park, a new group of young people from the National Civilian Community Corps (NCCC) is once again working at the park in Plymouth, VT. The eleven-member NCCC team, based out of the national service program’s Atlantic Region headquarters in Perry Point, MD, has constructed a 600-foot long fence along Coolidge State Park’s main road. The fence will prevent traffic from entering recreational areas where children play. It is a continuation of an NCCC project from 2009, when the park’s visitor center was constructed with the help of a different NCCC team. The log-railed fence has been constructed much like the park’s iconic log lean-tos and picnic pavilion constructed by the CCC in the 1930s. The NCCC team, Moose 2, spent three weeks peeling spruce bark by hand, and cutting and setting 20-foot segments of the fence. 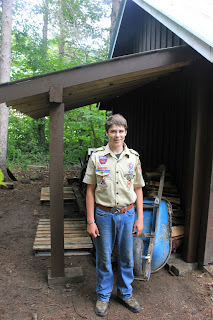 This past weekend Boy Scout, Patrick Clancy, built a wood shed at Camp Plymouth for his Eagle Scout project. The eagle scout project is one that must demonstrate leadership and provide service to a worthy institution other than the Boy Scouts with a project idea which is valuable to the community and a challenge to the Eagle Scout. And we thank you, Patrick for choosing Vermont State Parks! Paddling through the past UPDATE! Paddling through the Past is a multi-disciplinary archaeological project designed to investigate the role of waterways in the French colonial period. Their mission is to document the landscape archaeology of the Champlain valley and raise awareness of the need for heritage stewardship of the Lake Champlain/Richelieu Corridor. Day one: Aug 7 Finally, the trip has begun. Given the expected weather, we decided to truncate the first day travel and begin at the Chimney Point State Historic Site and make the short one mile paddle to DAR State Park. I had never been to the park before and was very pleasantly surprised. Guts, Gold and Glory: A phrase often used to portray the drive and determination of Olympic athletes in their pursuits of victory. It is because of their efforts and inspirational stories that we watch and support our country’s top competitors. We here at Maidstone State Park are no different. In an effort to show our support for our hometown Olympians and to also promote an active lifestyle for our country’s youth, we hosted our very own Maidstone Olympics, this past Sunday afternoon. With five events, individuals and teams competed to see who was the best of the best. Interestingly enough, we had individuals participate from both the US and Canada, making the competition that much more fierce. In the end, however, it was apparent that everyone was a winner. Prizes were awarded to top competitors, including donated and hand-crafted Gold, Silver, and Bronze wooden medallions. It was certainly an afternoon to be remembered. The sheer beauty of Vermont State Parks, not only attract guests from a variety of places with a variety of interests but also attract a variety of staff. Vermont State Parks Staff is composed of a dynamic groups of enthusiastic individuals. You may find “retired” employees from successful careers in almost any sector, people who grew up on a farm, young people just starting out, college students on a variety of career paths and long time park veterans, among others. All of these diverse backgrounds bring unique skill sets to the parks. So when Agnes Barsalow, the Ranger at Elmore State Park, suggested we swap a few staff members for the day, we here at Smugglers’ Notch jumped at the chance. Not only was it a chance for the staff to have a little variety over the summer but also a chance for each of our parks to learn from one another. Each park was able to learn about great things the other parks do and absorb tips and tricks from the staff at the other park. And, we had fun! Ever wonder about landscape archaeology and how landscape played a role in people’s lives in the past along Lake Champlain? Follow doctorate student Andrew Beaupre through his journey where he and his crew will be paddling through the past. Paddling through the Past is a multi-disciplinary archaeological project designed to investigate the role of waterways in the French colonial period. Their mission is to document the landscape archaeology of the Champlain valley and raise awareness of the need for heritage stewardship of the Lake Champlain/Richelieu River Corridor. 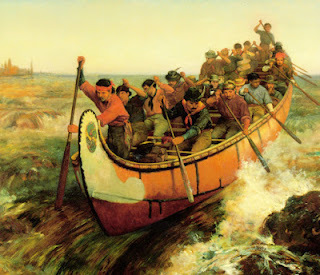 The culmination of the project will be a 10 day canoe expedition from the shadow of Fort Ticonderoga in New York, north to the forts of the Richelieu River in Southern Quebec. This will be the first expedition of its kind in the Champlain Valley, and is being undertaken as a portion of a larger multi-disciplinary archaeological project to better understand the history and heritage of the northern borderlands. Love the Vermont State Parks and day trips but not quite sure about camping? 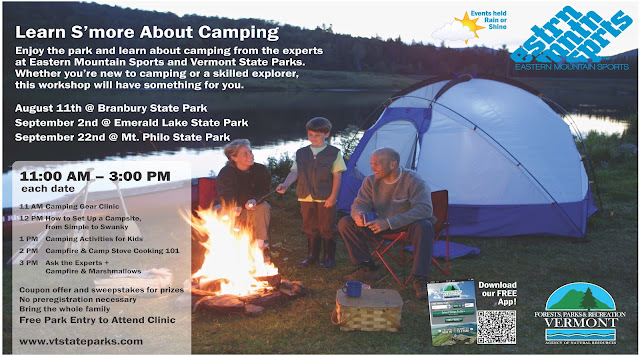 Come to one of the EMS and VT State Parks Clinics to Learn S’More About Camping! We’re sure once you try camping in a VT State Park you will be hooked for life! No pre-registration required. Free park entry for participants. Click the image to see the schedule larger! EMS will hand out gear checklists and coupons for both EMS and VT State Parks. We’ll also collect entries at each event for a grand prize raffle of an EMS gear package plus a free weekend of park camping.